It’s been a while since I’ve done High Five Friday. I thought I would change it up and bit and follow the lead of Falen and Laura at Upward not Inward. 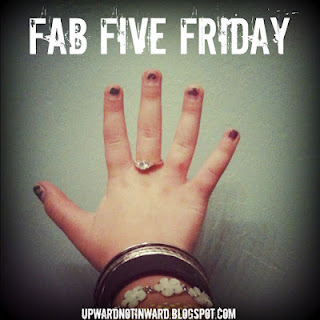 Every Friday they reflect on their week and post Five Fabulous things. Sharing 5 positive things from the week…. So, I’m going to give it a try. Join me! A dad who uses his voice to entertain. I love watching him sing karaoke. His voice is like no other! Sleeping in and eating lunch with Mike and friends throughout the week. This two week fall break has been amazing. That I have degenerative disc disease and a bulging disc. No wonder my back and hip hurts so dang bad! However, I can maintain this through some shots, maybe some physical therapy, and staying active. That’s the positive part of this! I meet with a spine specialist in a week and we will go from there. I also learned (as you read earlier) that loud noises and tight spaces can cause me to have a panic attack! So much! I’m ready for school to start back on Monday. My house is spotless (minus the office which I shall tackle today). I spent some quality time with all the littles in my life. I feel refreshed and rejuvenated and ready to tackle a crazy week of going back to reality and parent/teacher conferences. My nephew waking up from our slumber party (it’s almost noon!) and hanging out. We may just head to Skyzone so I can watch him bounce around and giggle. Or, we may be bums. I’m going to leave it up to him! Since I work in workers' compensation, I hear of degenerative disc disease and bulging discs on a daily basis almost. Yay for injections and physical therapy, right!!! Have a blast with that nephew of yours, girlie! Mine lives a few states away. What I would give to have a slumber party with that boy. 🙂 Enjoy all those hugs, giggles, and kiddie conversation. Love your Fab Five!! Love. Love. Love it!!! I am jealous of your 2 week fall break. I'm on my 1 day fall break today. Love your Fab Five as well! Bless You! Nice to read your blessings of the week! Glad you got information on your back pain and pray that your treatments will keep pain away. I just found your blog through Upward not Inward, im going to follow you right now 🙂 Have a great weekend. Thank you Laura! The two weeks was pretty nice, even if it was terrible to start on August 1st! Thanks for following! I'm looking forward to checking out your blog. Have a great week!